Taken with Olympus E500 digital camera on July 23rd 2007. Click image for larger view. In this photo you see the family boathouse again (check this photo to see it with the fjord as a background). 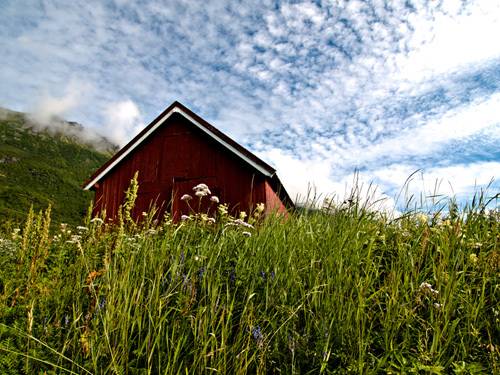 Loved the way the blue sky, clouds and the mountain created a nice background to the boatshed. Loving that boatshed. Great background shot with the clouds, sky and grass…. amazing picture. i like that angle of the shed. you have some very nice photos of a very lovely place. i had the pleasure of visiting Bodo back in 1982. It was lovely. This is such a lovely photo. It makes me want to visit your country so very very badly! absolutely wonderful photo.. i love it… but cannot help but wonder why there is a boatshed in the middle of a field??? paisley: Good question! I’m actually sitting and photographing from a beach . The boatshed haven’t been used this summer and thats why there is growing lots of plants in front of it. There is a field right behind the boatshed.